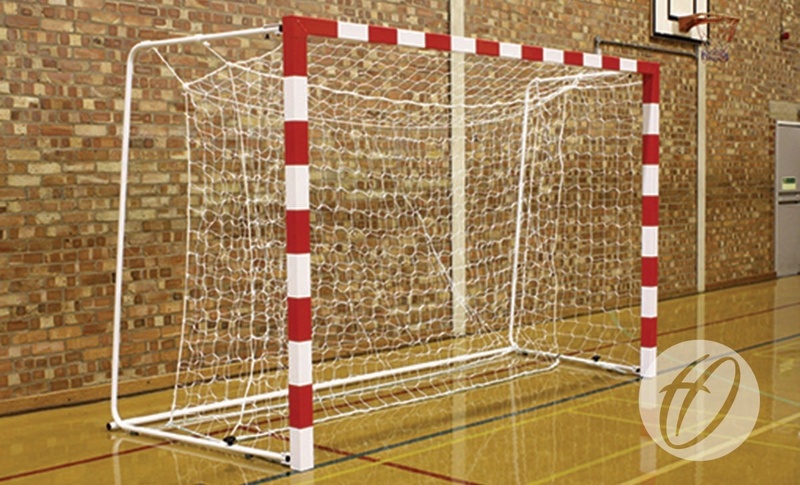 This regulation aluminium handball goal is the ideal choice for top level matches with its angled side frame and freehanging net. Plunger mechanism allows net supports to fold easily. Detachable backbar for ease of use and storage. Product must have floor sockets what are sold seperatley. Made from 80mm square reinforced aluminium. 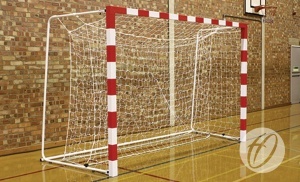 31.8mm steel folding net supports with a 1.1m top and a 1.3m bottom runback angled out to facilitate free hanging net. Overall goal size 3520mm Wide x 2080mm High x 1352mm Deep. Please Note: Handball goals have a short runback in comparison to the height of the posts, therefore they must be anchored at all times.